The AUC Press Nature Foldouts publication series has been my passion for the last few years, but they hardly pay the bills. Instead, I work in television to scrape by, working as an art director on history and science based documentary programs for channels like Discovery, the History Channel, Weather Channel, and National Geographic. Last year I worked as an art director on a series called BIG HISTORY for H2 (History Channel). 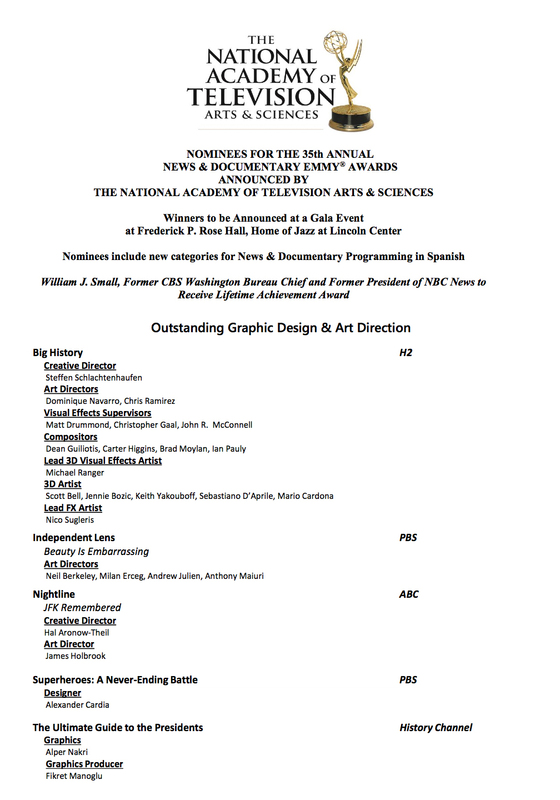 And today it was announced that along with several of my colleagues, I have been included on the list of nominees for “Outstanding Graphic Design & Art Direction” for the 35th ANNUAL NEWS & DOCUMENTARY EMMY AWARDS! I’m shocked and so grateful for wonderful assignments and an amazing team of people who I have been blessed to work with since 2007! It kind of makes all the crazy hard work, long hours, and intense stress feel a little less brutal. This entry was posted in Related Stories. Bookmark the permalink.